1 pound flounder fillets or any firm-fleshed fish, such as cod or flounder, cut into serving-sized pieces. Place fillets in a layer in greased 9-inch baking dish. Saute onion, zucchini and green pepper in oil until crisp-tender; spoon over fillets. Top with tomatoes. Combine sherry, lemon juice, salt, basil, pepper and pepper sauce; pour over fillets. Bake, uncovered, in preheated 350-degree oven for 25-30 minutes. Remove vegetables and fish to heated platter. Serve over rice. Pour pan juices over fish and vegetables if desired. Preheat oven to 500°F. Season fillets with pepper to taste. Dip in oil and dredge in breadcrumbs to coat. Arrange in a single layer in a lightly oiled shallow baking dish. Bake 10 minutes until golden, without turning or basting. Thaw fish. To thaw quickly, partially defrost in microwave, then separate pieces under cold running water. Check each piece and remove any small bones. In saucepan, cook onions in margarine until tender but not brown. Add crab meat, Stove Top brand stuffing, parsley and salt and pepper. Stir to mix and remove from heat. Spoon stuffing mixture over fillets and wrap ends under, creating a "roll". Place seam side down in a rectangular baking dish. Tip: For fillet pieces that are too small to stuff, simply place close together in the baking dish and spread with crab stuffing, then top with additional pieces of fish. Preheat oven to 350°F. Melt butter in a saucepan over medium heat. Sauté onions and rosemary 4-5 minutes until onions are tender. Add next 4 ingredients. Heat 5 minutes, stirring occasionally. Let cool. Place 1/4 cup mixture on each fish fillet. Roll up and secure with toothpicks. 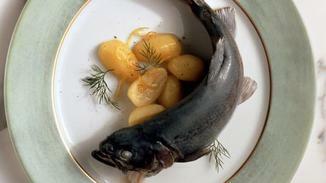 Arrange fish rolls in a shallow buttered baking dish. Bake 20 minutes. Combine soup and water in a bowl. Pour soup over baked fish, stirring around sides. Bake another 15 minutes, or until heated through. Sprinkle with paprika and serve. 1. Rinse fish and pat dry. Line cookie sheet or baking pan with foil for easy clean up. 2. Combine mayonnaise, Parmesan cheese, mustard, and pepper. 3. Spread fish with the mixture. 4. Broil about 5 inches from source of heat for 4 to 8 minutes, or until fish flakes when probed with a fork. 5. Sprinkle with parsley. Serve immediately. Preparation: Marinate fish in soy sauce in a glass dish for 2 to 3 hours. Combine remaining ingredients. Remove fish from soy & brush liberally with honey mixture. Place fish in shallow baking pan. Spread mayonnaise over each piece of fish. Sprinkle Old Bay seasoning over mayonnaise. Shake soy sauce on top and broil in oven until brown, about 15 minutes, 400 degrees. Put bluefish fillets into plastic bag, pour in marinade, seal bag and allow to sit in refrigerator for at least one hour. Turn packet over so that all sides are in contact with the marinade. Remove fish from package and preheat broiler. Place fish about 3 inches from heat and broil approximately 10 minutes per inch of thickness. Check fillets to make sure all bones have been removed. Rinse in cold water, drain, pat dry with paper towels. Dip fillets in batter and deep fry at 370 to 375 degrees (do not overload cooker). Cook (turning frequently) until fillets are floating and golden brown (3 or 4 minutes). Remove to rack to drain, then place in single layers on paper towels. Serve hot. Mix dry ingredients in a bowl. In another bowl, beat eggs, stir in beer. Pour beer-egg into flour mixture, beat until smooth and consistency of pancake batter. *Or cod, haddock, pollock, etc. Cut the bluefish into 4 even pieces. Rub with salt and pepper to taste. Saute scallions, ginger, garlic in sesame oil. Add sesame seeds, soy sauce, wine and lemon juice. Simmer 1 minute. Place half of mixture on bottom of baking pan. Put fish on top of mixture, adding remaining half to top of fish. Bake for 20- 25 minutes at 350 degrees. Thaw fish, if frozen. In a shallow bowl, combine the crushed crackers, grated Parmesan cheese, and snipped parsley. In another shallow bowl, combine the flour and pepper. Place lemon juice and egg in separate bowls. Dip fish in lemon juice, then in flour mixture, then in egg, and finally in the cracker mixture. In a 12-inch skillet heat shortening or cooking oil. Add fish in a single layer. Fry over medium heat for 5 to 7 minutes or till brown. Turn fish; fry for 5 to 7 minutes more or till fish flakes easily when tested with a fork. Drain on paper towels. Serve fish with lemon. Garnish with parsley, rosemary, and dill if desired. This delicious dish can be prepared for a noon campfire if the camp itself has a blender or food processor in its kitchen or prepare before the trip at home. If the fish is to be a sizable one, be sure to take enough foil in one piece; if the servings are to be individual for each guest, then cut the foil accordingly. Clean the trout and sprinkle inside and out with lemon juice, salt, pepper and herbs. Put vegetables through the food processor, mix well and strain. Saute vegetables in butter until they are soft, and stuff each fish before wrapping loosely in foil. Place in ashes or on cookie sheet in 450 degree oven for 15-20 minutes. Serve. Combine stuffing mix, tomatoes, onion, sugar, salt, tarragon and pepper. Set aside. Mix butter and lemon juice, brush outside surface of fish. Place fish in pan on rack. Fill inside of fish with stuffing mixture sew or skewer. Brush top surface with lemon butter. Bake in oven 300 degrees for 30 minutes until fish flakes easily when tested with a fork. Drizzle extra lemon butter over fish before serving. Prepare marinade: Combine soy sauce, sugar, garlic, green onion, and oil; set aside. Place sesame seeds in a medium frying pan and stir over medium heat until they begin to brown (they brown quickly, so watch). Add to soy sauce mixture. Lay fillets skin down in a single layer in a pan with raised sides. Pour soy mixture over fillets. Let sit for a moment, then turn fillets so they are flesh side down. Cover and refrigerate for 30 minutes. peel. (if making sauce ahead, leave out the chives and lemon peel. Stir sauce over low heat to rewarm - do not completely melt - then add chives and lemon peel)Makes about 1 cup In a small bowl, combine the garlic, il, rosemary and thyme and parsley. Pour about 2/3 of it into another bowl and reserve for the vegetables. to 25 minutes for a fillet 1.1/4 to 1.1/2 inches thick in center. Serve with Roasted Vegetables and Lemon Chive Sauce. (Note: Put vegetables in oven to bake 20 to 25 minutes BEFORE putting striper in to bake) Peel carrots and trim stem ends. Cut potatoes into eighths. and the vegetables early so they'll be ready to go when it's time for baking. Big pieces of brightly colored vegetables look quite festive alongside salmon. A convenient way to cook the vegetables is in a roasting pan (a disposable pan makes clean up really easy) The sides are high enough to allow you to place the baking sheets with striper or Herb Toast right on top to bake. Wash tuna steaks and pat dry. Place in a shallow, non-aluminum panlarge enough to hold them in one layer.In a bowl, combine olive oil, sherry vinegar, soy sauce, ricevinegar, minced shallot, garlic, cilantro, ginger, jalapeno andsesame oil. Stir well. This soy-sherry vinaigrette can be used as a sauce or salad dressing as well as a marinade.Pour 1/2 cup vinaigrette over tuna steaks. Marinate about 2 hours,turning steaks every 30 minutes.Remove tuna from marinade, pat dry and grill until cooked rare,about 4 minutes a side. Serve and pass remaining soy-sherryvinaigrette as a sauce. Marinate fish for 2 hours in Italian dressing (enough to coat fish). Grill 5 minutes, one side. Turn and lightly season. Cook 5 more minutes. Check for doneness. Cooking time varies due to thickness of fish. Place fillets in a large pan (at 3 inches deep) lined with tin foil. When it is freshly caught, we do not put any seasonings on it. Cover with tin foil, and join the edges together, so the fish will poach in its own juice. Cook in a hot oven (400 degrees F) for about 10 to 15 minutes per inch of thickness. DO NOT OVERCOOK! We test it during cooking. Pull back edge of foil, insert a fork. If there is no resistence, it is done. Drain off, and serve with a slotted spoon. Then serve with Joe Hyde's Beurre Blanc. Do not pack down the chopped shallots in the cup when measuring them. Slowly simmer the shallot with the vinegar in a saucepan over medium heat until all the vinegar has boiled away (about 4 minutes). Be careful, if the shallots burn or even get brown, the taste of the sauce will not be good. Add water and bring to a boil over high heat. Quickly whisk in the butter, piece by piece. All of the butter should be incorporated. Add salt and freshly ground pepper to taste. Stir in parsley just before serving. Do not try to keep sauce or to reheat it. It will not matter if it is barely warm or almost cool, since the fish will be hot and the plates warm.